When the news reached us that Richard III was going to be buried in Leicester, I decided that if possible, we should mark the event. 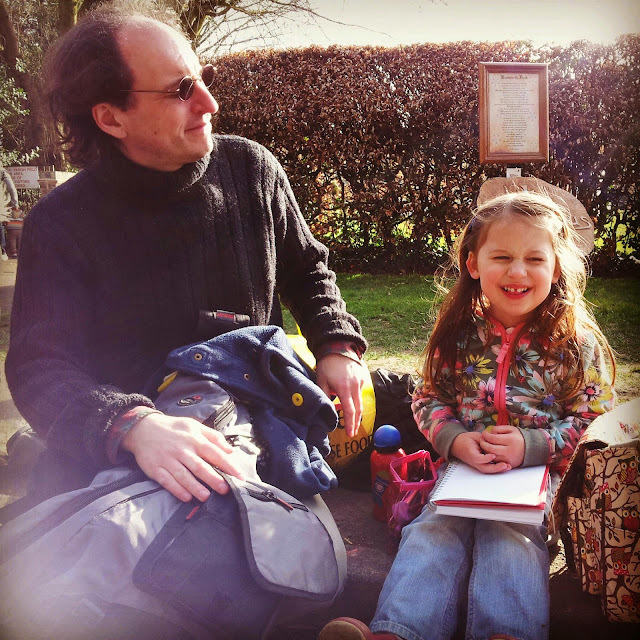 At four, M is too young to appreciate who Richard III was or the significance of a funeral for a medieval king, but I none the less wanted her to get some sense of the man, while also increasing her burgeoning understanding of history. My problem was, when it came down to it, I just didn't know very much about Richard III, the late medieval period or The War of The Roses. Admittedly, we were unlikely to cover any of these areas in any depth with M at this age, but if she asked me any difficult questions I wanted to have a clue as to how to answer. I came across a MOOC about Richard III from Leicester University, through the FutureLearn site, so signed up. The course itself is supposed to only take three hours of study a week, but when you are already squeezed on available spare time, that is a lot to fit in. Somehow I did it, I even completed the course yesterday (as M wanted to know the end of the story) doing a 'week's worth of work in one day! The MOOC incidentally, was very good and I highly recommend it to anyone who wants an introduction to life in England during the latter part of The War of The Roses. The course lost me a bit during the first week, going through the political intrigues and switching allegiances which marked The War of the Roses. After that however, I was back on more familiar ground looking at culture, life, food, books and ideas around death in the 15th century. The upshot of the course is that blogging and indeed anything else I'd normally do in my spare time, has taken a back seat for the past few weeks. While I did hunt around for any further information on the War of the Roses, Richard III or medieval life, I couldn't find much in the way of resources that would have appealed to M. Like most four year olds, M likes castles, but she likes castles because they are old buildings rather than because of knights and princesses. Most of the resources intended for children, seem to focus solely on this aspect. In the end, I went for just talking about Richard III in the context of the Tudors and Shakespeare, who is a recent discovery for M.
We watched the video above and sang along to the Richard III song, sung here by children in Leicester. We browsed the King Richard in Leicester website, which I summarised for M. We watched the videos in the last part of the course together and I answered questions. M was very curious about the whole process of how and why Richard III was killed and speculated on what might have happened if he had lived. 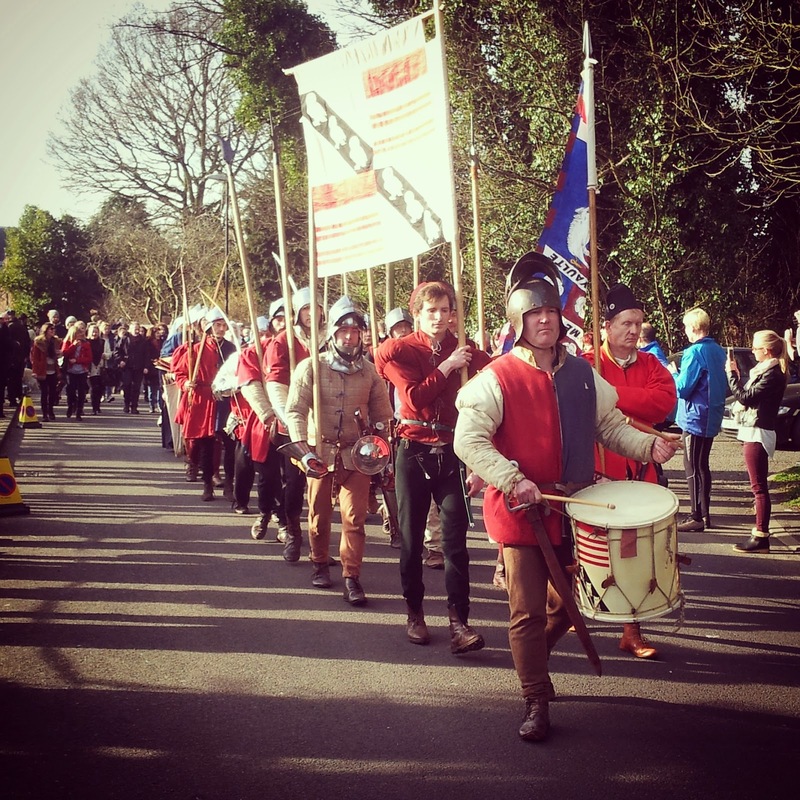 And of course, we headed into Leicestershire to witness the passing of Richard III's funeral cortege. After checking the events list, we headed to Market Bosworth as most likely to appeal to M. We parked in a field just outside the town and for the first time ever, the car got stuck in the mud! It had to be pushed onto firmer ground so I could park. We took a shuttle bus into the village, which amused M - "Mummy, a shuttle bus is a bus which zooms into space!" 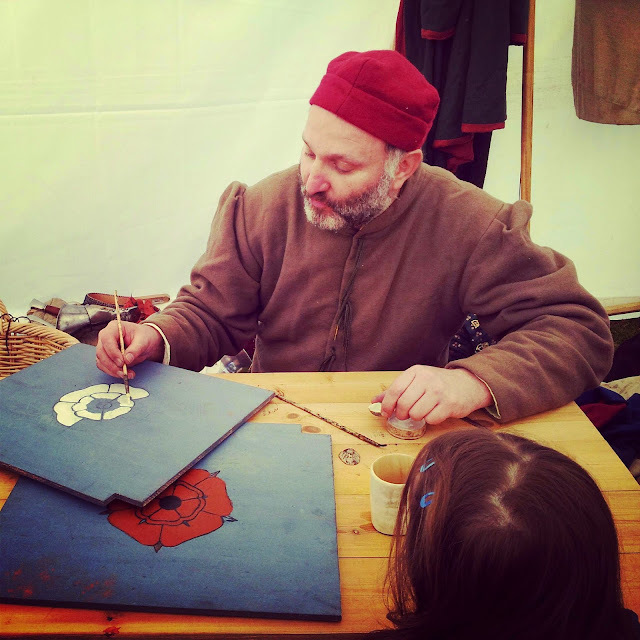 We got our bearings, ate lunch, M played with some leaves and we all chatted to re-enactors. 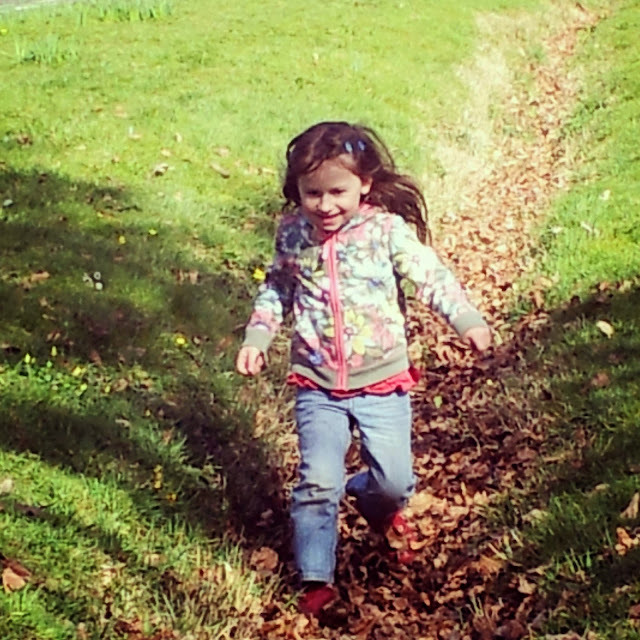 So much fun to be had in a leaf filled ditch. 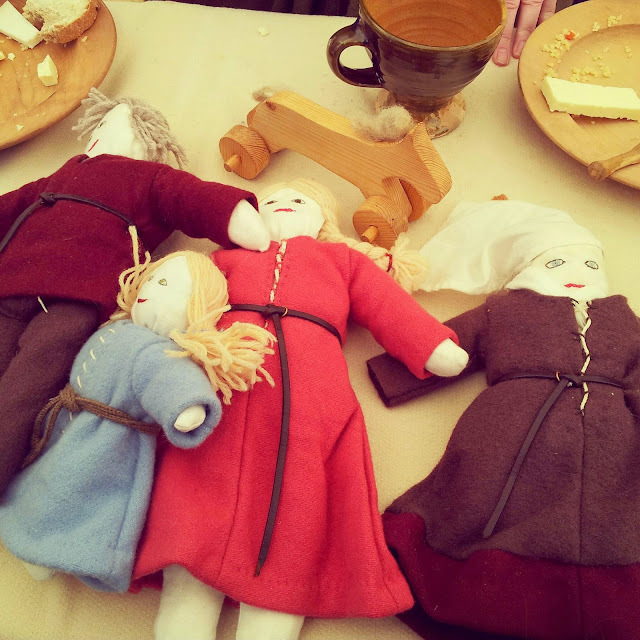 M liked these poppets, but the lady's sewing kit was more interesting. M watching and listening to the man painting standards. At the craft fair, M regaled a bemused sewer with her own sewing exploits, then we started looking for somewhere to watch Richard III go past. 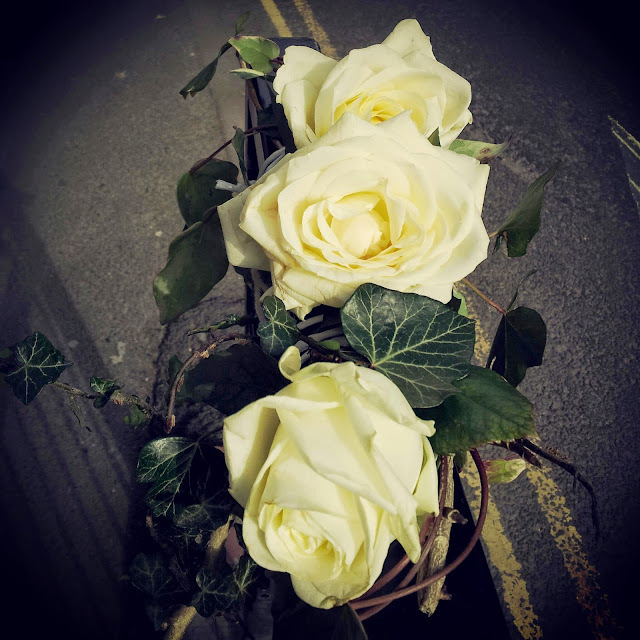 White roses lined the route of the funeral cortege. The market square and main streets in and out of the village were packed to the point that I carried M for her own safety, but we couldn't get through and were stuck in the press of people. In the end, we followed a man next to us with a pram which he was used to clear a path through the crowd onto the road itself (while his wife carried their baby). Walking along the middle of the road, surrounded by waiting crowds felt very strange but it was that or stay stuck. We found a less crowded spot at the end of the road where the cortege would pass us as it left Market Bosworth. Sitting on a kerb and waiting for Richard III. I think it is fair to say that while M was caught up in the event, she was underwhelmed by the cortege as it passed. Once the hearse had driven past as we watched in solemn silence, M asked loudly "But where is Richard III?" 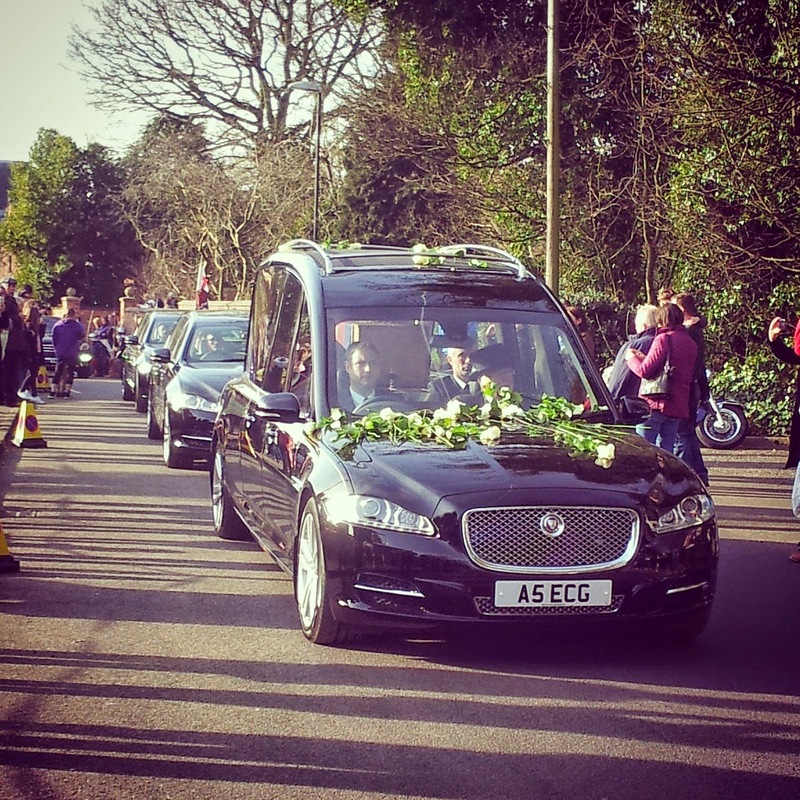 The funeral cortege of Richard III. The honour guard was more to her liking. 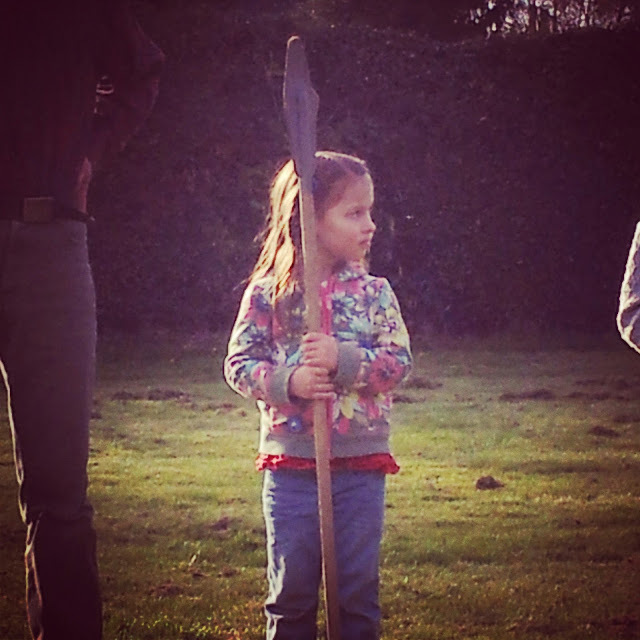 Once the cortege had passed, the crowds began to disperse but M had her first halberd drill before we headed home. M is drilled in halberd use. M insisted on having a go, following the re-enactors onto the field and having to be called off so they could demonstrate safely. 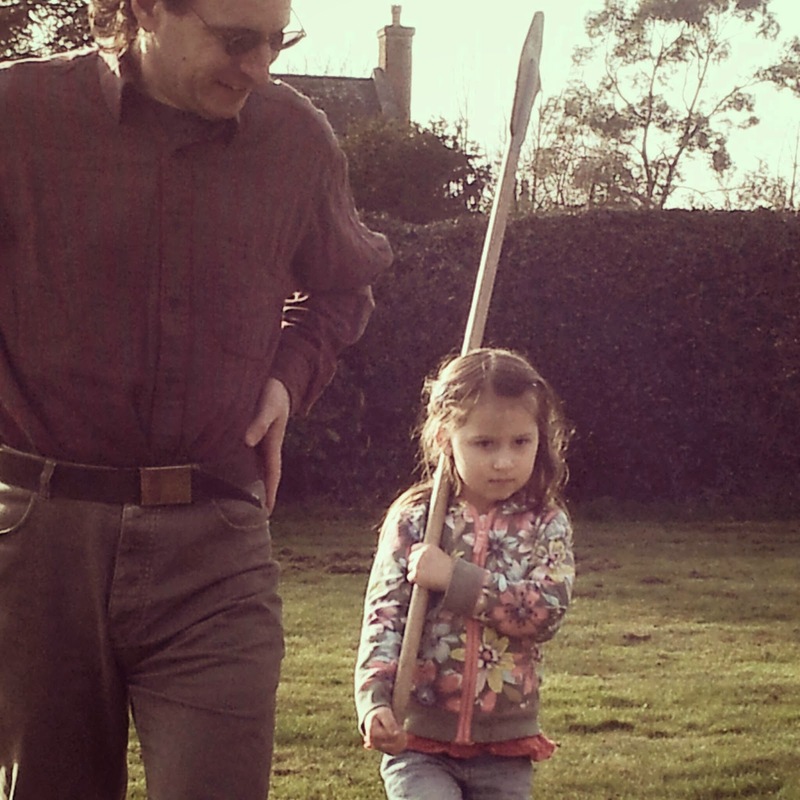 Being the smallest and youngest child on the field presented its own problems as M had difficulty controlling the halberd, which is why Dave accompanied her. There were issues with the instructions too - take five paces backwards for example... M had no problem doing this, but her little legs covered about 2/3 as much ground as the other children, leaving her on her own and breaking the line. 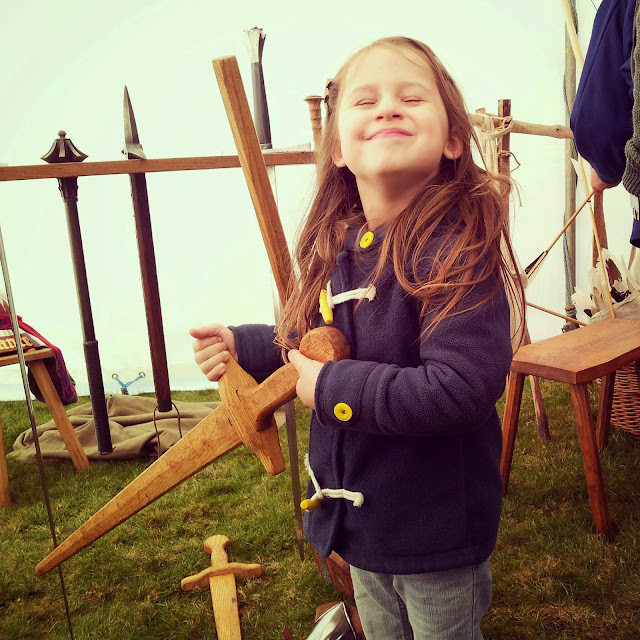 Concentrating very hard on holding the halberd as she 'knee-bends'. M was thrilled and could be heard cheerfully correcting the captain who was running the drill, as she took exception to his use of words. "One look at your ugly faces..."
"But my face isn't ugly!" So ended a fabulous day out for all of us and we happily walked back to the bus stop to catch our ride back to the car. After a bit of hesitation, the car moved off the mud, allowing us to go home, tired but happy that we went to witness this historic event.